A pavilion where there is a place to give food to the gods. Kids sit by cabin at tables. Luce walked over to the Aphrodite table and sat down. Glacing around, she realised she was the only one here. Sighing, she twirled her hair with her finger, completly bored. She wished she could go on a quest someday instead of sitting around practicing her battle moves. She longed for excitement and danger. Erin headed in. She was the most senior of the camp, though because of the school year, there were not many here. "Hi Luce." she called sitting at the Athena table. "Hey Erin," Luce called back, shifting so that she was facing her. Being the second eldest at the camp, only Erin was her senior. "Whats up?" Erin was the only person at Camp half blood she could stand. She might even be able to count her as a friend. Erin thought about it. "Not much, although rumor has it we might visit Mount Olympus soon. Other then that. Nothing really. I had a strange dream though, I think it might have been something I ate. However it was my mother, talking to me. I can never be sure." She said, she thought about it, she'd only tell Luce this, no one else. the second eldest at camp, one of Aphrodite, could be trusted with her dreams. Luce shifted her position, leaning closer. It was a good thing the tables were near eachother. "Really?" she asked, forgetting about Mount Olympus. "You dont just dream of your Mother or father god/godess. It has to be sent to you." Her eyes were sparkling now. It had been forever since she had received a dream. "What did she have to say?" She really wanted to know, not just trying to be nosy. "That is, if your OK telling me," she said hurridly. "It was rally wierd, because what she said made no sense to me. You must protect us. You must save us. It sounds like the gods can't save themselves but we know thats not true. I wonder what's stirring in Mount Olympus. I mean, Athena is the goddess of wisdom, so it sounds like she's giving advice by asking for help. I'm not sure what to think." She said, her eyes filled with worry. What had happened to her mother? She'd have to talk to Chiron. Luce gasped. "No way! That sounds like quest material to me. We sould talk to Chiron about it." She smiled, her her eyes were troubled. What did it mean? Were the Olympians in trouble? Erin nodded, she guessed it did, but a quest in the middle of fall? There were no campers left for her to take right now! "Maybe, but I think it might be better to wait for more signs, I mean Athena might be testing my leadership skills. It could be nothing, I like to imagine things." He said, but she wondered why the gods would pick her. Lead Councilor of Athena Cabin. "No." She rested a hand on Erins shoulder. "It is something. Want to go tlalk to Chiron together after?" She gave a small smile. She was still a bit frightened. Chris padded into the hall silently. For a big guy he made little noise. He sat down at the Herme's table, quietly ignoring the other two girls in the hall. He had no reason to listen to their talking. He sighed and looked at the table, sketching a figure with his finger. "Yea, let's go talk to Chiron after breakfast. I wonder where Ryder, Chris and Lynn are." She said, normally she was the last one to the mess hall. Being here first was always... well a first for her. she normally slept in, she always ended up over booking herself. She then saw Chris enter. "Never mind, there's Chris." she said. Luce glanced over at the new guy. Rumor was he still had to be claimed. "Hey," she called over to him. 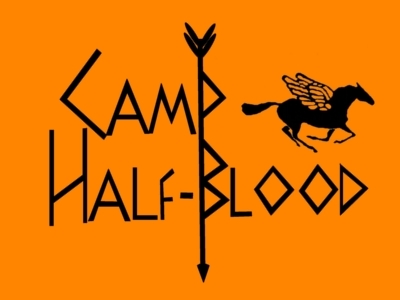 "Welcome to Camp Half Blood." She smiled and turned back to Erin. Chris looked up and smiled. He remained quiet, at least he wasn't being ignored. He sighed and continued looking at the floor. He wanted to be claimed and know who his goddess mother was. His father had died a bit before he had gotten to Camp Half-Blood. So he felt very lonely. Chiron walked over to the pavilion, seeing the troubled look on Erin's face, something had to be up. "Can I talk with you and Luce afterwards, I see a troubled look in your eye." He said to her before going up to the staff table. He took some of his food and put it in the shrine. "To the gods." He said and put some of it in, he sat down to eat the rest. Erin nodded, once she gave some to Athena and asked for guidance and wisdom, she sat down to eat. Luce nodded and stood. Walking over to the shrine, she scarped some of her food in. "To the gods. Please give me and Erin guidance," she whispered. Turning, she walked back over to her table, a small smile on her face. Hopefully Chiron would be able to give them some answers. And maybe her mother would come to her in a dream. A small shadow flickered across her smile. She didnt want her mother to visit her. Never. Chris watched silently as Chiron came into the Mess Hall, the male seemed to shrink a bit. He sighed and waited as everyone else offered food to the gods. He too stood up and scraped a good portion of his food into the shrine. "To the gods and whoever is my parent, may I know soon." He sat back down and ate quietly, he really needed to know. He so desired to know! Erin ate her food fast. It wasn't five star or anything. No, simply Orange Juice, Hashbrowns, pancakes and sausages. She finished it and looked to see if Luce and Chiron were done. They might have a quest on they're hands. Chrion finished his food and went to the big house. There were important deals to discuss. Luce shoveled the last of her hashbrowns into her mouth and savoured the taste. Glancing over at Erin, she gave a small nod. She was ready, if Erin was. Standing, she wondered who was on dishwashing duty. Her gazed followed Chiron as he left the pavilion. She rested her hand on Erins shoulder. Her blond hair fell infront of her face and she soved it back impatiently. "Ready to go?" Chris watched them leave, the loneliness sinking again. Sure he hadn't spoken but it was nice to see someone at least. He ate the food quietly. He was never a picky eater so he said nothing about it. He finished eating and took out a small notebook. He slowly began to draw a horse. Luce pulled her hair back into a pony tail and glanced over at Chris. "Be right back," she promised Erin. Walking over to Chris, she plopped down beside him at his table. "Hey Chris," she said, her eyes sparkling. She couldent wait to see who his mother was. Chris looked up from his half drawn horse. "Hey." His voice shook nervously, and he shook his head and lied the notepad down. "Luce, right?" He had barely gotten to the camp, and wasn't sure of everyone's names yet. He smiled kindly, as he was not the rude kind of guy. She laughed. "Yeah, Luce. Counceller of Aphrodite." She tried to keep the malice out of her voice when she said her mothers name, but some crept in anyway. "So, how do you like it at Camp Half Blood so far?" She glanced down at his notepad. "Nice drawing by the way." Chris nodded, "Aphrodite goddess of beauty, I could have guessed." He smiled, he wasn't flriting just trying to make conversation, "Um its ok I guess, I don't have anywhere else to go do I?" He couldn't help but feel resntment. He missed his father a lot, and his 'mother' had yet to claim him. He looked at his horse drawing, "Thanks it uh, it was a horse I had." Luce nodded her head. "Yeah, I had to leave a dog behind." She sighed, and pushed an escaped strand of hair behind her ear. "Trust be, being the daughter of Aphrodite is no thing to be proud of." She dropped the last part to a whisper. "So, you still have to be claimed?"